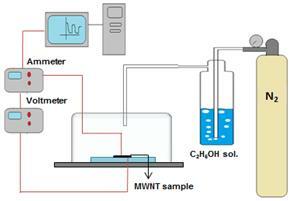 Multi-walled carbon nanotubes (MWNTs), synthesized by thermal chemical vapor deposition, have been used to fabricate a prototype sensor. The sensor was investigated for its sensitivity towards different concentrations of ethanol vapors at room temperature. Electrical measurements of the sensor showed an increase in resistance upon exposure to the ethanol vapors, denoting a p-type response which was fast, reversible and reproducible at room temperature. Our prototype MWNT- based sensor showed a significant and sharp increase in resistance for ethanol vapor concentrations as low as 5 ppm. It is proposed that hydrogen bonding of the functionalized groups on MWNTs with adsorbed molecules is responsible for this response.